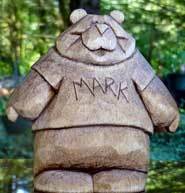 50th Anniversary of Wood Carvings Celebration With 50 Bear Wood Carvings! Each new Christmas season brings new ideas for ornaments. Special orders considered. The Rabbit and Squirrel Ornaments can both be reversed in design if requested, so pairs can be created in case two of the same ornaments are needed for the same tree. 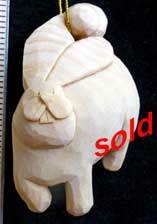 Carvings Available For Immediate Shipment! and many fine art carvings. No need to wait for a custom order, we have beautiful carvings that you can have shipped to you without any waiting at all. 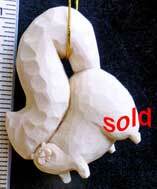 We would suggest that you order soon because we always sell out of these hand carved beatuful collector's items. Click here to view the carvings that remain in stock.